Veteran Recounts Battle of Adobe Walls. 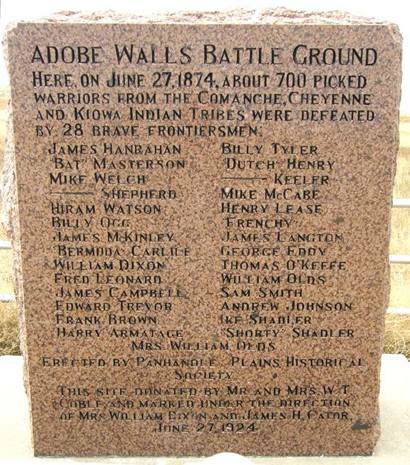 Fifty years earlier, surrounded by hundreds of hostile Indians, Andrew Johnson and the other occupants of the Panhandle trading post and buffalo hunter’s camp called Adobe Walls fought desperately for their lives. Now an old man, Johnson stood facing a crowd of more than 2,000, a different kind of fear twisting his gut. >One of only two living survivors of that June 27, 1874 battle, he had been invited to talk about what he had seen on this very spot a half-century before. The occasion was the dedication of a large granite monument commemorating the fight that triggered what came to be called the Red River War, the U.S. military campaign that vanquished the Plains Indian from Texas after 50 years of vicious conflict. In the summer of 1924 Johnson’s final journey to Adobe Walls started where the first one had begun so many years before -- in Dodge City, Kansas. A Swedish immigrant born in 1845, Johnson had come to Dodge City in the spring of 1874 and opened Western Kansas’ first blacksmith shop. He ran the business only a few months before selling out to Adam Schmidt after deciding he could earn a better if more dangerous living hunting buffalo in Texas. That marked the start of a lifelong friendship with the Schmidt family, which is why in the spring or early summer of 1924 Johnson came to Adam’s son Heinrich to ask a favor. Heinrich Schmidt had served as Dodge City’s postmaster and edited the Daily Globe. In his prime, Johnson could shoe a horse, skin a buffalo, grade tanned hides, and wrangle recalcitrant mules. And later in life he had made a good hand running a cement crew replacing Dodge City’s old wooden sidewalks with smooth pavement. But he knew nothing of writing a speech. Accordingly, he approached Schmidt to type up something he could read when the big day came. As soon as it was convenient, one night Schmidt went to Johnson’s two-room frame house on Front Street, just south of Dodge City’s famous Boot Hill cemetery to interview him about his experiences at Adobe Walls. Johnson had made the 150-mile trip many a time in a wagon, but as the day of the monument dedication approached his friend Tom Stauth offered to drive him from Dodge to the site of Adobe Walls. When the Kansas men motored to within sight of where the old trading post had stood, Johnson began to get excited. Stauth hardly had time to stop his Model T before Johnson bailed out, running almost childlike to spot where he had fought to save his scalp so many years before. After taking in the scene, Johnson and other guests enjoyed a barbeque lunch hosted by W.T. Coble, whose Turkey Track Ranch took in the Adobe Walls site. Heartily supporting the monument, Coble had deeded to the Panhandle Plains Historical Society a plot of land that included the graves of the three men killed in the fight. With airplanes circling overhead, the dedication program began at 1 p.m. When it came time for him to make his talk, Johnson tried but couldn’t do it. Having lost a battle with himself, Johnson handed his speech to Gene Howe, editor of the Amarillo Globe-News. Like most everyone else in Kansas, Johnson knew Howe’s father, writer Ed Howe. Editor Howe cleared his throat and started reading Johnson’s narrative. “On the morning of June 27, 1874, at 2 o’clock…the ridge pole in Hanrahan’s saloon broke with such a loud noise that it woke every man in the camp,” he read. To keep the roof from caving in, Johnson and others got on top and threw off as much dirt as they could. That didn’t take long and everyone went back to bed. But Billy Dixon, who planned on leaving later that morning for Dodge City with a load of hides, decided he might as well just stay up. That proved providential. What Johnson saw that morning struck him as beautiful in an awful sort of way, and he still remembered it clearly. Finally, after Dixon killed one of their leaders, the Indians gave up. Johnson was back in Dodge City for good by 1878 when the last shipment of 40,000 buffalo hides left town. The buffalo nearly extinct, Johnson turned to other ways to make a living. On June 12, 1925 -- less than a year later after the dedication of the monument at Adobe Walls -- Johnson joined his fellow defenders in death. He’s buried in Dodge City’s Maple Grove Cemetery.